If you can see it on the web, you can share it with your Facebook friends. If you want to share a Youtube video with your Facebook friends it’s easy, when you’re viewing a Youtube video you have a link for “Share” and then you have an icon for sharing to Facebook. But, what if you want to share an interesting article you see while browsing the web? What about a blog post of interest, or a video that is not on Youtube? 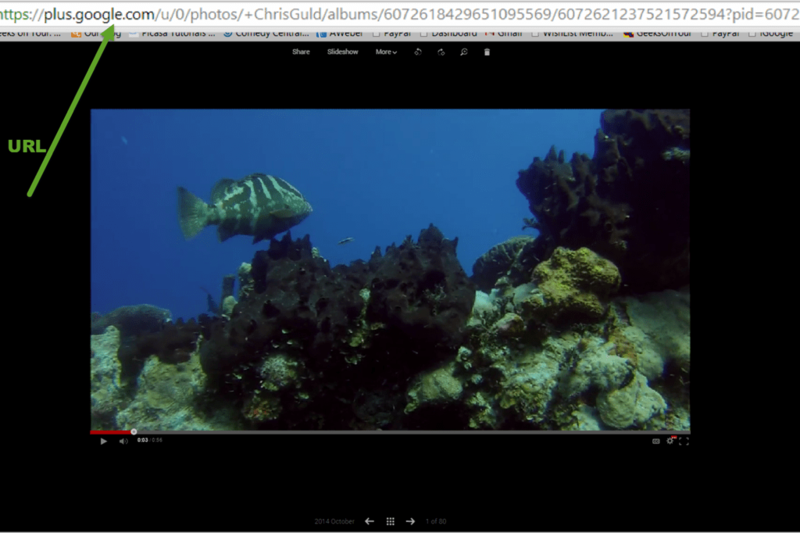 Below is an image of the screen while I’m viewing a video we posted on our Google+ Photos page. There is no icon to share this with Facebook, so how do I do it? Anything you can see on the Web has a Web address, aka a URL (Uniform Resource Locator.) In this example, the URL is the long string of text at the top. Simply copy that URL, and then paste it into a Facebook Status update box. Now, here’s the cool part … once Facebook interprets that link, it will add an image and description, if available. Then you can erase the actual link, it is no longer necessary, so you can type a few introductory words and your friends don’t need to see that ugly, long link. You can also edit whatever description was automatically placed. Just click on it and you should see it turn editable, with a blinking cursor. Who can see a Link you Share? 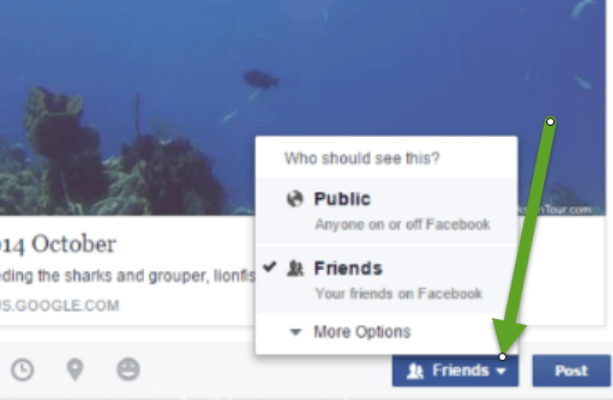 If you copied a URL from somewhere else on the Web, then you have complete control over who can see that on your Facebook Timeline. Just click the dropdown arrow for the audience selector and choose whether you want it to be public, just your friends, or special groups under More Options. However, if you’ve shared something you originally saw on Facebook, then you can’t make it visible to more people than the original poster did. For example, I saw a picture on Facebook posted by my friend Debbie. I could tell that she set the audience to her friends by noticing the icon. That means that only Debbie’s friends could see her picture. When I share that same picture by clicking the Share link, I can select the ‘Public’ audience, but it won’t matter. If someone is not Debbie’s friend they won’t be able to see that post of mine. The original poster controls who can see what they post … period. When Sharing a Blog – share the URL of the individual post. A lot of people keep personal, travel blogs. They post a link on Facebook whenever they write something new in their Blog. It’s a great way to keep a Blog and use Facebook to promote it. But don’t just share the URL of the main blog, for example: www.GeeksOnTour.Blogspot.com. If you click on the title of a post, you’ll see that the URL changes to specifically link to that post, for example: http://geeksontour.blogspot.com/2014/09/palm-springs-and-our-online-show.html. When you share that link, it will always take people to that individual post, not the current Blog post. Published by MrsGeek, in Blog. Tagged with Facebook, URL.